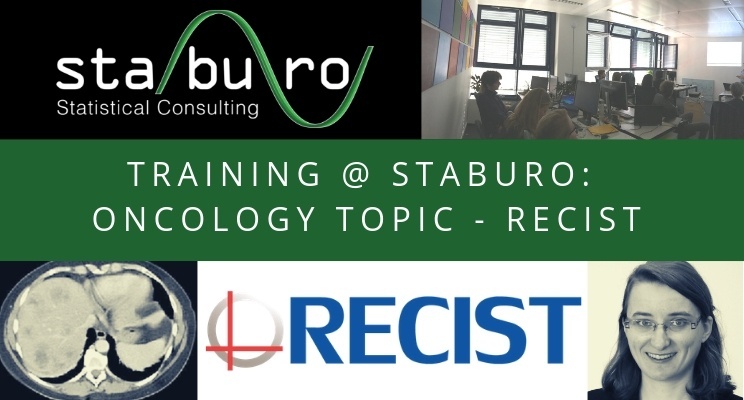 At Staburo, we are working on a lot of oncology projects. Dealing with data from this particular therapeutic area does not only require good statistical knowledge, but also to understand how the status of the patients themselves is evaluated and which are the medical objectives behind that. More precisely, this training intended to describe how the patients with solid tumors are evaluated in oncology trials. This occurs with the commonly used RECIST criteria, from which the latest version (1.1) was presented. First, CT or MRI scans are performed for each patient at baseline to describe the existing lesions. At several timepoints of the trial, images are performed again to evaluate these already detected tumor lesions and to detect potentially new lesions. Measurements of lesion sizes are performed on these images, which then lead to a response evaluation: “Complete response”, “partial response”, “stable disease”, “progressive disease” (PD), or “not evaluable”. This response can trigger the (dis-)continuation of patients in the trial (mostly in case of PD) but is also useful to evaluate efficacy of the treatments tested. Details of the RECIST criteria were presented such as definitions of measurable and non-measurable lesions, target and non-target lesions, measurement rules (including Sum of Longest Diameters), as well as rules for assessing a response to a patient. The next step of the analysis is the derivation of endpoints with the help of the response assessment. These endpoints were described in the presentation: they are mostly binary endpoints such as Objective Response, and time-to-event endpoints such as Progression-Free Survival. The usual methods of analysis were as well part of the presentation. Finally, other types of criteria in oncology were shortly introduced: RECIST applies to solid tumors, but not to blood cancers for example where specific criteria are necessary.